Nope, this time I fell foul of The Ebay Droids. 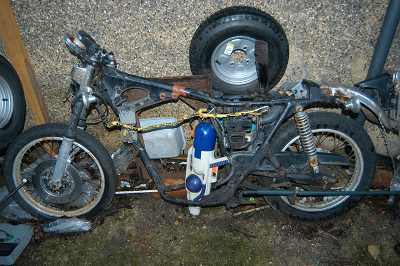 I quote: "eBay appreciates the fact that you chose to list your auction(s): 2448756945 Honda CB500T rolling chassis - horrible. eBay does not allow listings that are intended as jokes or items that are not for sale. Therefore, we have ended the auction early and credited all fees to your account. Please view our guideline page for a better understanding of our auction policies and how they affect the way you list your items"
Joke? JOKE? I am deadly serious about selling this thing. It is an excrescence: a horrible boil on the sylvan landscape that is my part of south-west London. It was ugly when new, uglier still by the time I started stripping it down, and now it would make an orc cover its face and start to whimper. I want it off my land, out of my sight, and money to slide, jingling festively, into my pocket. To recap: you are bidding on the rolling chassis of a 1978 Honda CB500T, one of the most undesirable motorcycles ever made, now rendered even less desirable by the passage of 25 years and the complete absence of any engine, seat, controls, handlebars or indeed anything that may impart to it the shaky vibratory wobbling motion it once possessed. The frame has been cut through, or snapped, aft of the top engine mount and has been re-welded. The wheels are rusty, the electrics decayed and mostly missing, the tyres devoid of tread, the forks pitted, and the front brake caliper absent. However, the rear wheel hub is good and as it's the same as a Honda CB550 hub, and they have a reputation for cracking, this might be worth buying for the hub alone. It's sound. Oh, and I intend to remove the indicator brackets for the benefit of the poor Belgian who implored me to send them to him a couple of days ago. What's it good for? Beats me. I use it as a ground anchor for my bike trailer - you can see the D-lock round the front wheel, and the other end is secured to my trailer. No keys, no warranty, but (incredibly) a valid registration document. Starting price 99p and no reserve. No, the water-pistol, spare tyre, and other oddities in the pic are not included. The lovely thing about the Web is that allows complete imbeciles to parade their inadequacy in front of a global audience. For some reason I wot not of, the majority of these trolls and Gollums plague Ebay sellers. Those who agree are invited to peruse my "me" page. Who knows, you might even find a nice link there to click on, if you fancy a mouse mat or something. So zero feedback bidders will have their bids cancelled unless they email me first. Anyone else I even suspect of taking the, er, the (mustn't offend Ebay, now) mickey will be similarly treated. I should add, following a serious enquiry (which nearly floored me!) that this machine does indeed come with the original air filter inlet hoses. See those rubber tubes with a bend in them? Those. They are, I am assured, quite sought-after in Honda CB500T circles. Yes, my mind is moving into boggle overdrive also. "Support groups" would be a more apt description. I have visions of a ring of semi-emancipated Australopitheci, moodily picking at each other's fleas. Quite like some of the Ebayers who so irritated me last time, in fact. More Honda CB500T relics. And, I note, currently attracting bids five times higher than mine. Will deliver for 50p/mile, each way, within radius of 25 miles of Sutton, SW London.